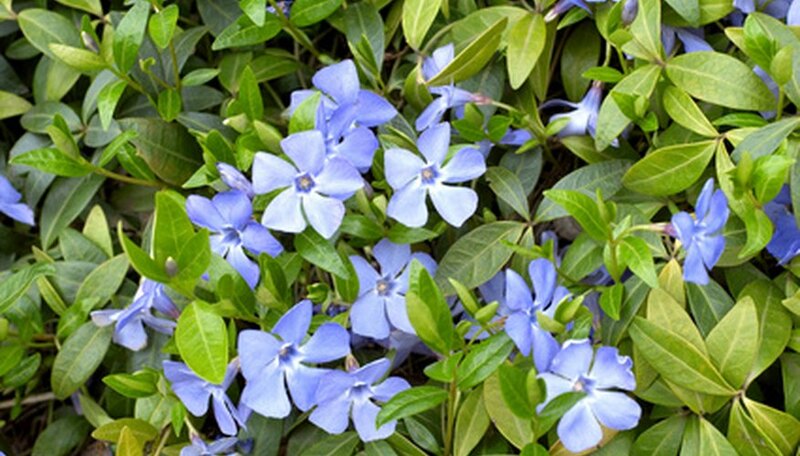 Vinca, also known as creeping myrtle or periwinkle, is a popular ground cover for partial to full shade. Grown as a perennial in zones 3 through 8, vinca’s glossy green leaves and pinwheel-shaped purple flowers make it a good choice for shady rock gardens, landscape beds, containers and steep slopes where it spreads quickly to control erosion. Drought, disease and pest resistant, creeping myrtle is also unpopular with local deer populations. Conduct a soil test in an area that receives partial to full shade. Vinca prefers a soil pH between 6 and 8. If your results show pH levels below this range, add hydrated lime or wood ashes. To lower soil pH, add aluminum sulfate or sulfur (available in garden centers), sawdust, composted leaves, wood chips or peat moss. Amend the soil as needed. Vinca grows best in well-drained but moisture-retentive soil. If your soil is sandy and drains quickly, add peat moss and compost in improve its absorbency. Clay soils drain slowly and will benefit from the addition of organic matter. Incorporate shredded leaves, grass clippings or compost to lighten the structure of the soil. Plant vinca plants 12 to 15 inches apart. Mulch with shredded leaves or cedar bark to conserve moisture and reduce weed competition. The trailing vines will root and establish new plants over the growing season. Water regularly during the first season. Once established, vinca is a hardy and drought tolerant ground cover. Vinca is a shade-loving perennial vine. It can tolerate early morning or late afternoon sun, but it will perform best in an area that is sheltered from intense midday sun.